Sofen K. Jena, Laxman K. Malla, Swarup K. Mahapatra and Ali J. Chamkha, Transient Buoyancy-Opposed Double Diffusive Convection of Micropolar Fluids in a Square Enclosure, Int. J. Heat and Mass Transfer, Vol. 81 (2015) pp. 681-694. Sofen K. Jena and Swarup K. Mahapatra, A numerical investigation of surface radiation interaction with magnetoconvection of an electrically conducting fluid imposed with a transverse magnetic field, Heat Transfer Engineering. Vol. 36 (2015) pp. 21-32. Sofen K. Jena, Swarup K. Mahapatra and Amitava Sarkar, Effect of Thermal Radiation Interaction with Thermosolutal Convection - A Critical Appraisal, Heat Transfer Asian Research, Vol. 44 (2015) pp.39-65. Sofen K. Jena, Vineel Kumar Reddy Yettella, Chinta Phani Rama Sandeep, Swarup Kumar Mahapatra and Ali J. Chamkha, Three–dimensional Rayleigh-Bénard convection of molten gallium in a rotating cuboid under the influence of a vertical magnetic field, Int. J. Heat and Mass Transfer, Vol. 78 (2014) pp. 341-353. Anjan Sarkar and Swarup K. Mahapatra, Role of thermal radiation on the functionality of thermoelectric cooler with heat sink, Applied Thermal Engineering 69 (2014) 39-45. Swarup K. Mahapatra, Mixed Convection Inside a Differentially Heated Enclosure and its Interaction with Radiation—An Exhaustive Study, Heat Transfer Engineering, 35 (2014) 74-93. Sofen K. Jena and Swarup K. Mahapatra, Role of thermal radiation on buoyant convection of industrial dusty air, A numerical investigation, Heat Transfer Research (In press). Sofen K. Jena, Swarup K. Mahapatra and Amitava Sarkar, Coupled magneto-buoyant convection and radiation in an inclined enclosure: An exhaustive study, Int. J. of Numerical Methods in Heat and Fluid Flow, Vol. 24 (2014) pp. 237-264. Sofen K. Jena, Swarup K. Mahapatra and Amitava Sarkar, Double diffusive buoyancy opposed natural convection in a porous cavity having partially active vertical walls, Int. J. of Heat and Mass Transfer, Vol. 62 (2013) pp. 808-817. Sofen K. Jena, Swarup K. Mahapatra and Amitava Sarkar, Thermosolutal Convection in a Rectangular Concentric Annulus: A Comprehensive Study, Transport in Porous Media, Vol. 98 (2013) pp. 103-124. Sikata Samantaray, Swarup K. Mahapatra, Sofen K. Jena and Amitava Sarkar, Transient Analysis of Mixed Convection in a Bottom Heated Square Cavity in Presence of Surface Radiation, Computational Thermal Sciences, Vol. 5 (2013) pp. 401-423. Sofen K. Jena and Swarup K. Mahapatra, Numerical modeling of interaction between surface radiation and natural convection of atmospheric aerosol in presence of transverse magnetic field, Applied Mathematical Modelling, Vol. 37 (2013) pp. 527-539. Sofen K. Jena, Swarup K. Mahapatra and Amitava Sarkar, Thermosolutal convection in a fluid-porous composite medium, Heat Transfer Asian Research, Vol. 42 (2013) pp. 281-299. Sofen K. Jena, Swarup K. Mahapatra and Amitava Sarkar, Magneto convection of an electrically conducting fluid in an annulus space between two isothermal concentric squares, Heat Transfer Research, Vol. 44 (2013) pp. 195-214. S.Samantaray, S.K.Mahapatra & A.Sarkar, Numerical Simulation of the Interaction of Diffusively Radiating Surface with Mixed convection in a Differentially Heated Enclosure, Heat Transfer Research, Vol. 44 (2013), pp. 507-534. S.K. Mahapatra, S.Samantaray & A.Sarkar, Role of Prandtl Number in the Interaction Phenomenon of Surface Radiation With an Opposing Mixed Convection Within a Differential Heated Cavity. Heat transfer Asian Research, Vol. 41 (2012) pp. 318-338. S.K. Mahapatra, B.K. Dandapat & A.Sarkar, Radiation transfer in participating medium interacting with variable property natural convection subjected to collimated/diffused irradiation at boundary—A critical appraisal, Heat transfer Asian Research, Vol. 41 (2012) pp. 164–178. B. Padhi, P.Rath, S.K. Mahapatra & A.K. Satapathy, Short pulse collimated radiation with diffusely reflecting boundaries, Heat Transfer Research, Vol. 42 (2011) pp. 301-315. R.K. Mallik, S.K. Mahapatra & A. Sarkar, Development of a Novel Improved Differential Approximation (NIDA) for Analysis of Combined Conduction-Radiation Heat Transfer (CCR) in a Two-Dimensional Enclosure with Participating Medium: An Experimental Validation, Numerical Heat Transfer, Part B, Vol.56 (2009) pp. 231-258. R.K. Mallik, S.K. Mahapatra & A. Sarkar, Neural Finite difference method in development of Improved differential approximation and its application for coupled conduction and radiation heat transfer in a square enclosure: an experimental validation, Int. J. Heat and Mass Transfer, Vol. 52 (2009) pp. 504-515. Anjan Sarkar, S.K. Mahapatra, & A. Sarkar, Opposing Mixed Convection and its Interaction with Radiation inside Eccentric Horizontal Cylindrical Annulus, Int. J. Num. Meth in Fluids, Vol. : 61 (2009) pp. 291-310. S.K. Mahapatra, Anjan sarkar & A. Sarkar, Numerical Simulation of Opposing mixed Convection in differentially heated square enclosure with partition, Int. J. Thermal Sciences, Vol. 46 (2007) pp. 970-979. S.K. Mahapatra, Interaction of radiation with opposing mixed convection within differentially heated square enclosure, J. Mech. Eng. Sci., IMechE-PartC, Vol. 223 (2009) pp. 451-462. S.K. Mahapatra, Numerical Simulation for optimal configuration of heater and cooler location with natural convection inside a square enclosure and the effect of radiation on the same in presence of radiatively active medium, J. Mech. Eng. Sci., IMechE-PartC, Vol. 222 (2008) pp. 1505-1514. S.K. Mahapatra, B.K. Dandapatat & A. Sarkar, Analysis of combined conduction and radiation heat transfer in presence of participating medium by the development of hybrid method, J. Quantitative Spectroscopy and Radiative Transfer, Vol. 102 (2006) pp.277-292. S.K. Mahapatra, P. Nanda & A. Sarkar, Interaction of Mixed convection in twosided lid-driven differentially heated square enclosure with radiation in presence of participating medium, Heat and Mass Transfer, Vol. 42 (2006) pp. 739-757. S.K. Mahapatra, P. Nanda & A. sarkar, Analysis of coupled conduction and radiation heat transfer - using a hybrid method, Heat and Mass Transfer, Vol. 41 (2005) pp. 890-898. S.K. Mahapatra & S.B. Mahapatra, Numerical Modelling of Combined Conductive and Radiative Heat Transfer within Square Enclosure using DOM, Heat and Mass Transfer, Vol.40 (2004) pp. 533-538. S.K. Mahapatra, S. Sen & A. Sarkar, Interaction of Surface Radiation and Variable Property Natural convection in a Differentially Heated Square Cavity- A Finite Element Analysis, Int. J. Num. Meth. for Heat & Fluid Flow, Vol.4 (1999) pp.423- 443. 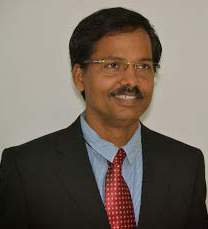 Professor, School of Mechanical Sciences, Indian Institute of Technology Bhubaneswar (Since ..April 2013). Associate Professor, School of Mechanical Sciences, Indian Institute of Technology Bhubaneswar (July 2009 - April 2013). Funding agency: Dept. Science and Technology, GOI.